Perfect for celebrating and great as party favors, this 4-piece Party Sports Whistles Set features colorful plastic whistles with stickers of a basketball, soccer ball, basketball and baseball. 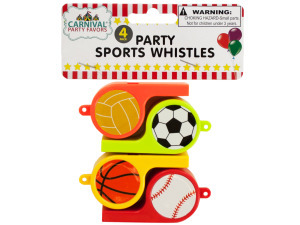 Each whistle measures approximately 2.75" long and has a hole for attaching cords (not included). Comes packaged in a poly bag with a header card.